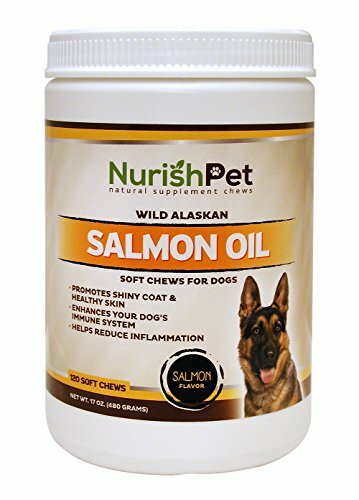 Where to buy fish oil for dogs? How much fish oil should I give my dog? How often do I give my dog fish oil? 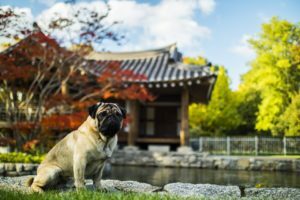 Why use fish oil for dogs? 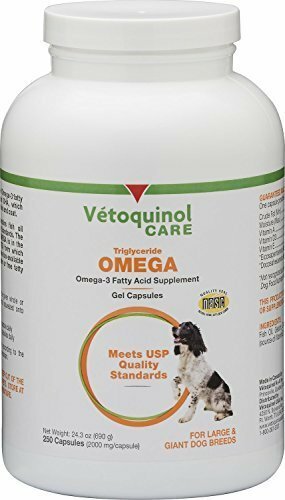 Are fish oil capsules/liquid safe for dogs? 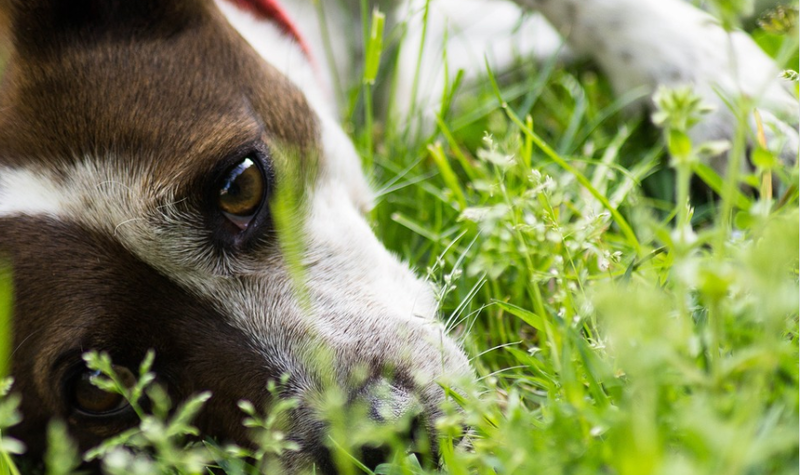 Does fish oil help reduce dry, itchy skin in dogs? 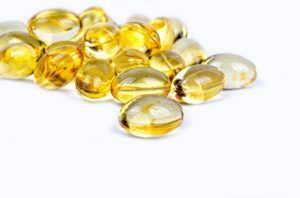 What’s the difference between salmon oil, krill oil, and regular fish oil? It is no mystery that fish oil offers benefits to all of us; countless researchers have been done on that topic, but not many people actually know that the fish oil can be extremely beneficial to our dogs as well. Fish oil is considered to be a great diet for dogs, mostly due to the fact that it has exactly the right fats that the dogs need. This, in turn, can help the dogs be fitter and healthier. Many have been wondering why is it exactly the fish oil that helps the dogs (and cats as well) so much. Well, the answer to this is really simple, and it has to do with the fact that the dogs and cats would intake a lot of fish oil if they were feeding themselves in the wild. This is exactly why adding some fish oil supplements to your dog’s diet could help out a lot and you should do it as soon as possible if you haven’t already. Not having fish oil in their diet could lead the dogs to miss out on some amazing nutrients, which are in fact necessary for the dogs to lead a normal life. This guide is going to show you everything there is to know about fish oil and how beneficial it can be to dogs, and we are also going to offer you our recommendations on 5 top fish oil supplement product that you can find on the market. NurishPet was founded by a Veterinary Technician that has had over 23 years’ experience in the field. With over two decades of experience in Veterinary Medicine, it’s easy to see why the owner of NurishPet has had such success producing a reliable, organic fish oil for pets. The Wild Alaskan Salmon Oil has been praised all around, by customers and professionals alike, for its healing capabilities. NurishPet’s Salmon Oil Chews are 100% safe to use and doesn’t include any substances that could harm your pup in any way. The soft chews are also 100% gluten-free and you will be able to see a distinct improvement in the dog’s health within weeks. There are many benefits to giving these chews to your dogs. Above all, it will improve your dog’s heart health, their skin, their coat, any arthritis/joint problems and inflammation problems in general. Fish oil is ideal for treating all sorts of health issues, and can drastically reduce anxiety and seizures too. Many customers report that after giving the chews to their dogs for 30 days, their coats have drastically improved. Most dogs are prone to having flaky skin or shedding a lot, and that can be frustrating for both the pet and the owner. Luckily, these chews are a wonderful solution to the problem. It’s important to start slowly. If you have smaller dogs, start by giving them half a chew, or a third of chew and see how it affects them. If there are no adverse effects, you can gradually increase the dose to 2 chews a day. For bigger dogs, two or three chews a day should be enough. Why We Like It – If you want to improve your dog’s health, the best way to do that is by purchasing NurishPet’s all-inclusive package. When buying this product, you will get several solutions to your dog’s health problems. It won’t damage the condition of your dog’s teeth/gums, it will improve the glamour of their coat, will drastically improve joint mobility and is filled with nutrients such as omega 3 and omega 6. This fish oil supplement can be found in pump-bottle dispensers, making the packaging just perfect. The packaging comes in containers of various ounces, and what’s important to note here is that Grizzly Salmon Oil supplement only uses 100% pure oil retrieved from the Alaskan salmon. This is an amazing supplement that contains more than fifteen various fatty acids, as well as Omega 6, Omega 3, as well as the Arachondic fatty acid groups. As we have already mentioned, an amazing thing about this product is its pump bottle dispenser, which allows for the bottles to be easily refrigerated and stored. It also allows the dog owners to easily add exactly the right amount of fish oil their dog needs. Also, the pump is highly practical, because it creates no mess. One pump roughly equals about 1,000 mg of fish oil, which is the right amount for a 30lbs dog, which basically allows you to measure the amount of fish oil you wish to serve to your dog extremely easy. The main reason why this product has found its place on this list definitely has to be the fact that it is naturally sourced. You can always question whether the product actually comes from nature with other fish oil supplements, but here you know that’s true. This means that the product definitely has no mercury in it, and there are numerous tests done to confirm that. The product comes from a 100% natural Alaskan salmon. Why We Like It – This is a 100% natural product with oil coming from Alaskan salmon. It also has more than 15 various fatty acids, Omega-3, Omega-6, as well the Arachondic ones, which make for an amazing product. Grizzly seems to be an amazing company because this is already the second fish oil product of theirs that has found its place on our list. The Pollock Oil also comes in a pump bottle, which is just one I the long list of reasons of why this product is just so popular, and why this company has so much attention pointed at it. The company says that this product has the highest Omega-3 to Omega-6 ratio and that the entire product comes from a rich, sustainable and affordable source. The benefits that this product offers are amazing, just like the benefits of the salmon fish oil product of the same company are. The pump bottle is great and allows for the users to get the oil without creating a mess. And one of the reasons why this particular product is so popular is its low price compared to the similar products of a similar size. Why We Like It – This product also comes with a pump bottle, which is a huge plus. This particular fish oil supplement has the highest Omega-3 to Omega-6 ratio, which is a great feature of this supplement that comes from a sustainable, affordable and rich source. Recently, TerraMax has also come out with their own brand or fish oil supplies, and it would seem that it is just good enough to find its place on our list. 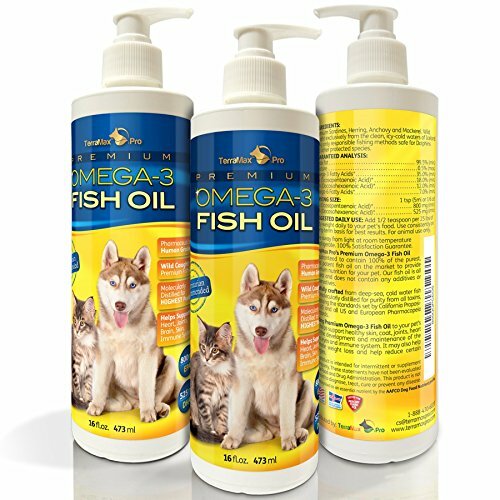 This is a product out of their line of Omega 3 fish oil supplements, primarily for dogs. The quality of this company is something that comes without even saying, as does the quality of this fish oil product of theirs. It is extremely popular, and just like some other products on this list, it comes in a pump bottle, which is extremely easy to use. This company is great because it offers an unconditional 100% guarantee for this product, but you shouldn’t really count on using it, because the product is amazing, and you’ll have no problems with it. This particular fish oil supplement comes from herring, sardines, mackerel, as well as anchovies, and there are no fillers. According to the dos owners who have tried this product, it only takes a couple of weeks of this product use for you to start seeing the positive changes on your dog. Why We Like It – This is this company’s first Omega-3 fish oil supplement for dogs, which focuses on quality. It also comes with a pump bottle, which is extremely easy to use. This fish oil supplement for dogs is one of the best sellers online and is also at the same time the first one on our list that comes in a capsule form. Each capsule is a 2,000 mg capsule full of fish oil, as well as Vitamins A, E, and D3. The 2,000 mg dosage might be too much for some dogs, and that is why it is recommended for dogs under 30 lbs of weight to only take half a capsule. This is an amazing supplement because it successfully balances the fish oil and Vitamin E, which is something we’ve mentioned earlier in this article. Always go for the fish oil products that offer Vitamin E as an ingredient, because it saves you the trouble of giving your dog Vitamin E separately. This product comes with 250 capsules for you to use, and if you have a dog under 30 lbs of weight, this could easily be turned into 500 capsules! It is also a product that has exactly the right amount of EPA/DHA, which are basically the most important ingredients of a fish oil supplement that allow for all those beneficial things to happen to your dog. The capsules are gotten from cold water fishes from the wild, meaning that the product comes from 100% natural sources. 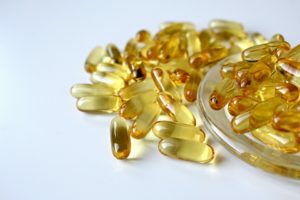 Why We Like It – This is one of the most popular fish oil products, and the first one on this list that comes in the capsule form. Each capsule offers 2,000 mg of fish oil, but apart from that, other ingredients include Vitamins A, D3, and of course, E.
This fish oil supplement is another one that comes to us in a bottle, and is quite special in the sense that it comes with a Rosemary extract which is being used here to stabilize the solution. Rosemary is really important in that sense because it is an antioxidant, which is great in eliminating that terrible odor that some fish oils seem to have. Some of the downsides of this products are the fact that does not have Vitamin E as an ingredient, nor does it have a varied level of fat variety as some other products, most notably the Grizzly ones. 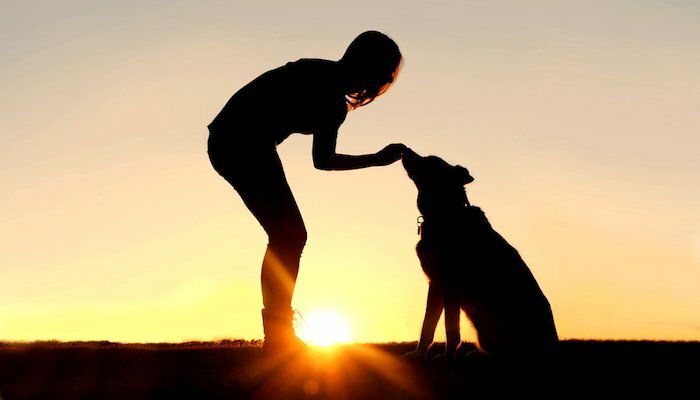 However, the product seems to be highly effective nevertheless, and that is proven by the fact that it is extremely popular with the dog owners, and that they themselves admit that the product is great. It should also be mentioned that this product does contain Omega-3 fatty acids, but unfortunately, no Omega-6 or any other varieties of these acids. Some dogs may find that positive, while others might find that to be a negative thing, it all depends on the dietary needs of the dog. Why We Like It – This fish oil supplement is a bit different in a sense that it uses Rosemary for stabilization, which helps the product to get rid of the terrible smell. The variety of fatty acids isn’t that high, and it does not have Vitamin E as an ingredient. And the second to last fish oil supplement on our list is the Nordic Naturals Omega-3 Pet, which is a bit different to all the other products on this list in a sense that it derives from the wild anchovies and sardines. This means that there is still a lot of Omega-3, as well as EPA and DHA content in this product, with the only difference being the fact that it comes from a bit different source. Also, the price is very different than the prices of all the other product mentioned here, because this one seems to be the most expensive one out there. This is due to the fact that the fishery where the fish oil comes from is located near Peru, and is considered to be the best fishery in the entire world! 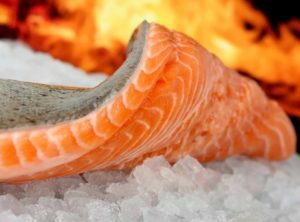 It is sustainable and has quality fish, meaning that you won’t have to worry about the quality of the product – it is all 100% natural and from a respected source. Even though the prices are higher, the dosages here are actually lower. It is recommended that the dogs that weigh between 20 and 40 lbs should only get a teaspoon of this fish oil, and the dosage moves up a half a teaspoon for every additional 20-30 lbs of your dog’s weight. This means that the product may cost more, but it is definitely going to last longer, and that counts for something. 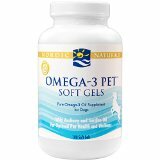 Why We Like It – Nordic Naturals Omega-3 Pet is a supplement obtained from wild anchovies and sardines, which are full of Omega-3 fatty acids, EPA and DHA. It is the most expensive product in this list but is also the one that is going to last the longest. We’ve given you all the basic information and benefits that the fish oil supplements could offer your dog, but we believe that it is also important to tell you which fish oil supplements are the best ones on the market in order for you to know what to buy. Keep in mind that all of the products here are completely natural and from natural sources, and have been inspected and have had their safety, quality, and the correct measuring of dosage screened. So, here are some of the fish oil supplements that we believe to be the best ones on the market. 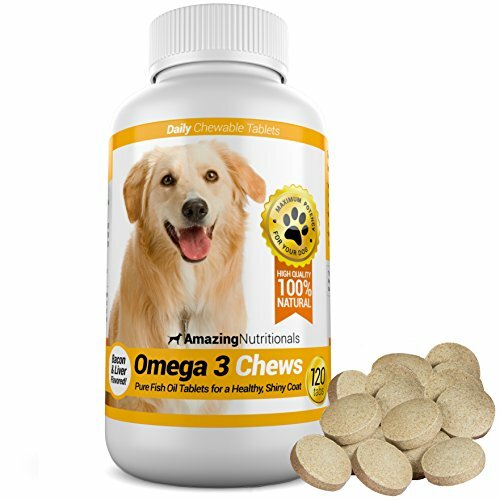 These chewable tablets by Amazing Nutritionals make feeding your pet supplements easier by the fact they are chewable! We all know that dogs love to chew, so this is a great feature. These Omega 3 chews are made from pure fish oil, and enable your pup to get the healthy, shiny coat he or she deserves! Healthier skin and fur. Fish oils are rich in Omega-3s which can help your dog have a much nicer and shinier hair and coat, and it can also do wonders to their skin. Reduced shedding, as well as dry skin and inflammation. This happens because the fish oil can moister the skin, which eventually leads to a better appearance, as well as to a reduced inflammation (even on the cellular level), which leads to less shedding. Find dog foods that can reduce shedding here. Improved stamina and immune system. This happens due to reduced inflammation. This also means that your dog will have a lot more energy for combating other diseases and illnesses, and the viruses and bacteria won’t cause him problems anymore. Also, this means that your dog is going to have more energy to play with you, to run, jump, and be an overall active dog. Improved joint health. This is another benefit that comes out of reduced inflammation. The dogs will no longer feel discomfort in joints, which is something that a lot of older dogs do experience, just like humans. Your dog will now be able to be active, have an improved immune system and enjoy better cardiovascular health. Gastrointestinal distress. Of course, some side effects are possible, and one of the most common ones includes gastrointestinal distress. This is something that usually happens when the pet ingests far too much fish oil at one time. These problems are usually noted by changes in the bowel movement of the pet or the levels of flatulence. The best course of action would be taking the pet to a veterinarian, who is going to recommend to you the right dosage of fish oil for your pet. Then, you ought to work your way up to that dosage. Reduction in clotting. Due to the fact that fish oil is extremely slippery, there were cases of people reporting that their dog’s platelets have issues sticking together, which in turn could lead to the slowing down of the clotting. The best course of action, and especially if you have a dog that is no stranger to getting hurt while playing outdoors, who is frequently getting cut, or who is roughhousing with other dogs, is visiting a vet, and asking about the right recommended dosage of fish oil for your dog. Also, dog owners ought to know that under no circumstances should they give fish oil to their dog if the dog is on any blood thinning drugs! Possible interaction with other anti-inflammatory medication. We’ve already mentioned the blood thinning medications, but the dog should not take any fish oil if he is already on any kind of anti-inflammatory drugs as well. This could lead to dangerous side effects. Under 30 lbs: Consult a vet. The amount will likely be under 1,000 mg of fish oil. 30-60 lbs: 1,000 mg is recommended. 60-90 lbs: 2,000 mg is recommended. 90-110 lbs: 3,000 mg is recommended. 110-140 lbs: 4,000 mg is recommended. It is not that difficult to spot a pattern here – an extra 1,000 mg of fish oil is recommended for every 30lbs of the dogs’ weight. Keep in mind that this is so mostly because of the fact that the fish oil contains EPA/DHA. It almost goes without saying that the dog owner ought to consult a veterinarian because as we have seen above, it is possible for the dog to be suffering from certain issues which are going to lower the recommended dosage of fish oil for safety reasons. 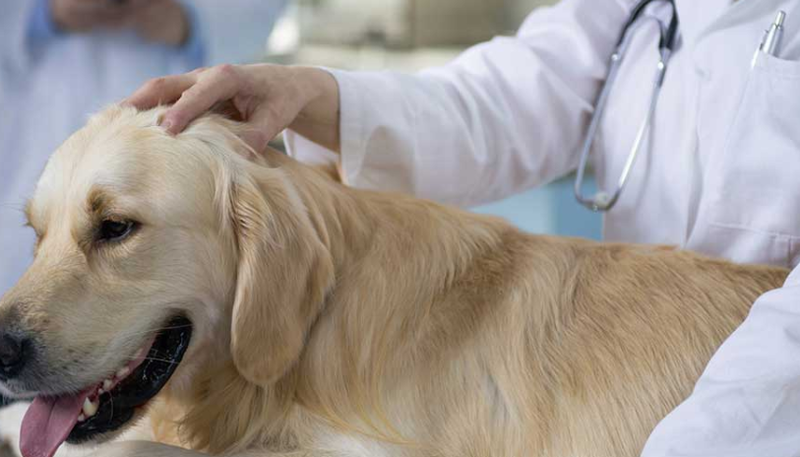 You should consult a vet even if you believe that your dog is not suffering from any conditions or diseases. It was discovered that the increased intake of fish oil may result in a decrease of Vitamin E, which is a vitamin that dogs really need. So, before you go ahead and buy a fish oil supplement, make sure you find the one that includes some Vitamin E, or if you can’t find one, you can buy Vitamin E separately and they give it to your dog together with the fish oil. Encouraging a healthy immune system. Reducing the wastage of the muscles and their degeneration. Therefore, it is important to note that the more fish oil you start giving your dog, the more Vitamin E the dog is going to need. Even though there is a precise formula in deciding exactly how much Vitamin E you ought to give your dog in case you increase the fish oil dosage, it is just important for you to note the correlation between the two. And the best solution for deciding how much Vitamin E you ought to get for your dog is just to go ahead and buy the fish oil supplements with a Vitamin E ingredient. This is a simple question, with a pretty simple answer because nowadays, you can pretty much buy it anywhere. Almost all of the pets stores have it because the supplement sale is one of their most profitable things, but you should also keep in mind that you can just buy it online. There are countless websites that offer the possibility of purchasing the fish oil supplements, and all you have to do is some research and then figure out which of these websites offers the best service, the best terms, the best products, and the best price. Probably the best one of them is Amazon. Basically, your dog can have the same amount of fish oil that an ordinary human would take. 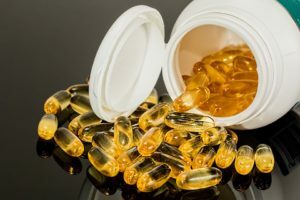 If you’re buying fish oil capsules to give to your dog, you’ll clearly see that they come in the form of 1,000 and up to 1,500 mg. One of those capsules is more than enough for a dog that has 20 lbs of weight, or even more than that. Lower dosages are necessary for the dogs that weigh less than that. Once again, it is essential for the dog owner to consult a vet before he starts giving the dog any fish oil supplements in any amount. One pill a day is enough, but as we have already mentioned, it all depends on the dog’s weight, health, etc. It is always wisest to consult a veterinarian first. Also, most of the fish oil supplements have some sort of instructions on the packaging, which means that you won’t be completely lost with this. Giving fish oil supplements to your dog can help the dog reap many benefits of such an action, and the most important ones of them have to include the fact that the fish oil can help dogs become healthier, happier, and have a nicer coat of fur. Fish oil is also important because it can decrease inflammation; which is really important for dogs that suffer from arthritis. It will help dogs, enabling them able to walk, run and jump around, which is what all dogs want. 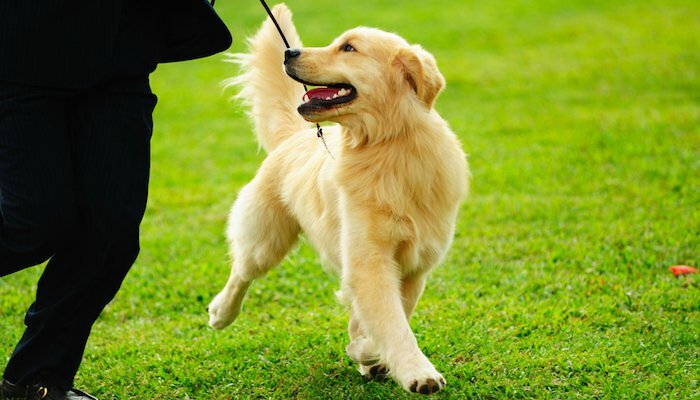 Make the walk even better with a reliable canine harness. 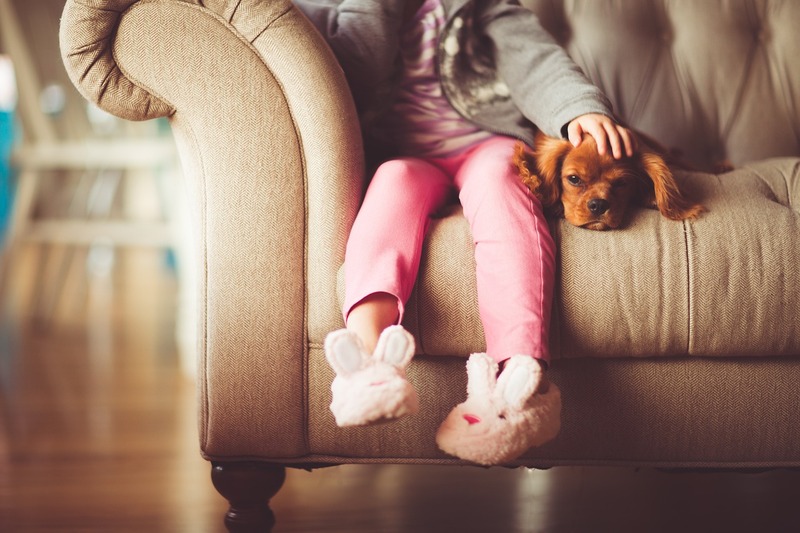 Improving the dog’s immune system is another benefit of giving fish oil supplements to your dog, and this means that the dog’s body will from then on be able to fight off any kind of infection or disease. These are all important reasons for the dog owners to seriously start thinking about buying fish oil supplements for their dogs – it will make them healthier, happier, and look nicer. It should first be said that the fish oil supplements can come in both liquid and solid forms, and either of those is perfectly safe for dogs, just like it is perfectly safe for humans. Dogs can take all the supplements that humans can take, meaning that you have nothing to worry about when it comes to fish oil supplements. Yes, fish oil can help dogs with itchy skin. If a dog is receiving the fish oil supplements on a daily basis, such an action would result in the improvement of the dog’s coat, as well as the skin. This means that the inflammation is going to be reduced, as well as the dryness and the itching of the skin. Another thing that’s great about fish oil is the fact that it can improve the look of the dog’s coat, which means that it is going to become shinier, softer and a lot healthier. Well, the difference that the most people know about and mention is the fact that the krill oil and the salmon oil can provide the dogs with omega-3 fatty acids which can be highly beneficial for the dog. These acids include the DHA and the EPA, but that is not the only difference between the three. Krill oil is not exactly a fish oil, because it is derived from crustaceans, and not fatty fishes. That is why it has a lot more of EPA. Also, krill oil has omega-3 fatty acids that contain astaxanthin, which is a really important antioxidant. However, fish oil has a longer life than krill oil. When it comes to the salmon oil, it derives from salmon, trout, albacore tuna, sardines, as well as various other types of fish. The best one product on this list has to be the one you knew we were going to give this title to, and that is the Grizzly Salmon Oil All-Natural Dog Food Supplement. It is a product that comes in a pump bottle, making it extremely easy to use, and a product that offers us a fish oil supplement of amazing quality. It is a great way for you to give a great supplement to your dog, without ever worrying if it’s safe if the dog is going to like it, if it is going to help your pet, etc. The bottles of this product can be stored rather easily, and the quality of the fish oil is one that can hardly ever be matched. The price is reasonable, which makes the product affordable, and that is why this one is our recommendation. If you are looking for additional dog supplements don’t forget to check out our other buying guides: best probiotics for dogs, glucosamine for dogs, and coconut oil for dogs guide. To read more about how omega 3 supplementations can help your pet – read this study or this study. Thanks for sharing these fish oil products for dogs! 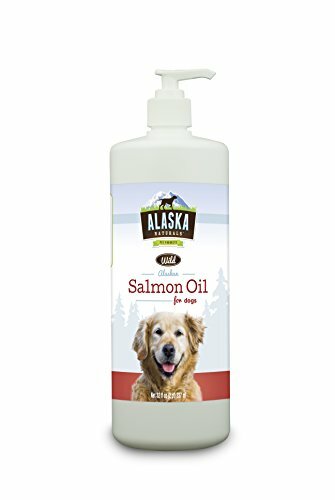 Went with the alaskan salmon oil, and I just wanted to thank you for helping my pups coat become shiny again.